Glycerol [Glycerin or Glycerine, C3H5 (OH) 3] is widely used in foods, beverages and pharmaceutical formulations. It is also a main by-product of biodiesel production. Simple, direct and automation-ready procedures for measuring glycerol concentrations find wide applications. This glycerol assay uses a single Working Reagent that combines glycerol kinase, glycerol phosphate oxidase and color reactions in one step. The color intensity of the reaction product at 570nm or fluorescence intensity at lambda ex/em = 530/585nm is directly proportional to glycerol concentration in the sample. 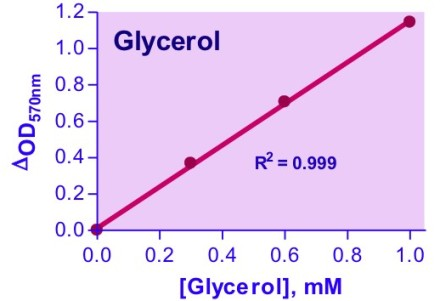 For quantitative determination of glycerol and evaluation of drug effects on glycerol metabolism. Shipped -20°C Dry Ice, Store at Store at -20°C., 6 months shelf life.